A flash mob took over the space outside the Immigration and Refugee Board in Montreal earlier this morning. The group denounced the arbitrary nature of refugee board decisions and specifically to show their solidarity with the Nemeth family, a Roma refugee family facing deportation in two days (on Wednesday, January 28th). 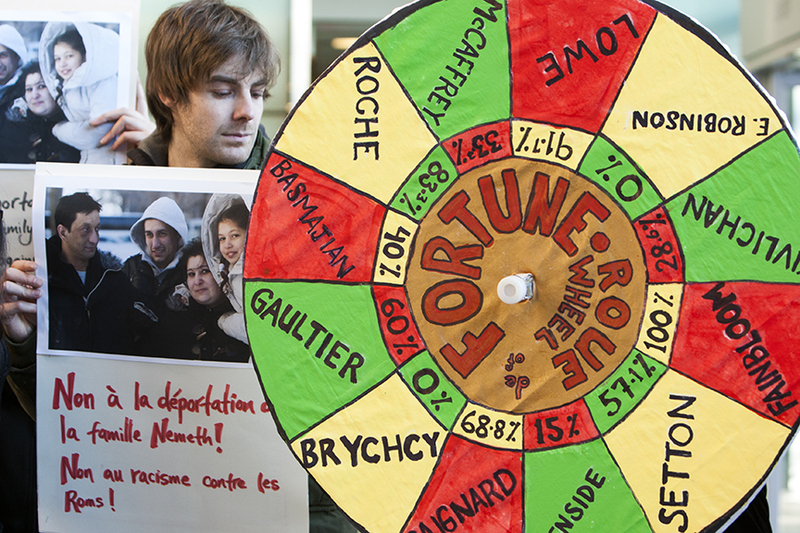 To the sound of the Chaotic Insurrection Ensemble, and with a giant Refugee Wheel of Fortune to illustrate the point, Solidarity Across Borders game show hosts explained that the Nemeth family’s refugee claim was rejected in 2013 by a commissioner whose acceptance rate for Hungarian claimants that year was 0%, while most other commissioners accepted far more; moreover, another part of the Nemeth family, relying on the same evidence, was heard by a different commissioner – and was accepted. Two commissioners, same evidence, opposite conclusions. Come to court on Tuesday to show your support the family as their lawyer argues for a last minute stay and write/call the Ministers of Immigration and Public Safety and tell them to stop the deportation. Details here.